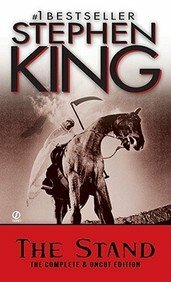 I'm not a huge Stephen King fan, not being a huge fan of horror books in general, but I do know him to be a great author, and The Stand absolutely blew me away. It is a stunningly complex novel, frighteningly real, with only a few hints at the supernatural. The story follows a few of the survivors of a mutated super-flu that kills most the world's population, and the two leaders that emerge for the remnants of humanity to flock to. It is a novel that had me asking and trying to answer some very deep and philosophical questions, and it is on my list of books that everyone needs to read. Released to Calgary bookcrossing group. The Stand has always been on my radar, but never picked it up. Glad it came into the group!